Notes: Well, since I brought it up yesterday, here it is! Awela is one of those words that’s just spelled out, but it is a native Kamakawi word. Its spelling was a late addition, though (previously it was just something you said). To follow up on a comment on yesterday’s post, yes, the Kamakawi do marry, and I’ve got a bunch of interesting terminology and ideas that go with the institution which I’ll introduce by and by. Anniversaries, though, don’t seem likely—same with birthdays, in fact, as both rely on a calendar—some way of marking precisely when something occurred one year prior. That doesn’t seem like something that’s natively Kamakawi. In the “modern” state, though, any such terms—along with the concepts—will have been borrowed directly from Zhyler speakers. Okay, how about this. This isn’t exactly the right word, but how about Zhüdüy? That’s more like the ruling class, but when it comes to invaders, there’s little difference, right? So there you go. From here on out, Zhyler speakers will be referred to as the Zhüdüy. That’s not too bad. Notes: Today is my and Erin’s second anniversary! Hooray! In honor of the day, I’ve chosen the word for “year” for today. It’s borrowed from Zhyler (the Zhyler word is ulür, or ulxr in the orthography), as the Kamakawi didn’t have a native concept of “year”. I was also pretty lazy with the glyph: Since it’s just spelled out with the syllabary anyway, I didn’t make a new image, but just used the syllabic glyphs for u and li. I hope you’ll forgive me. Today will be a fun day! Every day is fun that I get to spend with my wonderful darling wife. Notes: Oops! Forgot to post. But this is kind of turning into a mini-theme: Derivations of hea. Hooray impromptu theme party! Kind of a sad day, though. As everyone knows by now, the US lost to Ghana. Bleh. So tired of the US not dominating this sport… I think I’m perfectly justified in blaming the ABC family of networks. A he’ea ei i Lata Tuata a. Notes: True, I must admit. Today’s word is inspired by a new tag I’ve added to several of my posts: the audio tag. This tag will be added to any post for which I’ve recorded an audio version of the sample sentence. I don’t, of course, do that for every post every day (I have enough trouble keeping up with the posts themselves! ), but every so often, I’m not doing anything else, so I go back and record a whole bunch of them and put them up. If you want to go back and listen to those I have recorded, just click on the audio tag, and it’ll bring up the lot of them. By the time you read this, the game between the US and Ghana will have already been decided. I haven’t watched it yet, though (less than two hours away! ), so don’t tell me how it ends! Notes: And with growing strength and confidence in the air, etc. I was watching a really good episode of Danger Man just now, and I was inspired to do the word for fighting. As I’m typing, my little cat Keli is in the midst of a great battle between her and her little red string: her constant companion and ignominious adversary. I’m stopping after each sentence and making it dance about so she can pounce upon it. I’m not sure if her string has made it into a caturday photo yet. If not, I’ll be sure it does soon. Couple of knock-out matches tomorrow—including the US vs. Ghana! The US beat England, Slovenia, Algeria and the refs to reach the round of 16: Now it’s up to them. I just hope they don’t play sloppy—or timid. The time is now! Seize the moment! Fight! A hetela’o oi’i i neu pale. This is our linen closet, and Keli has carved herself out a nice little sitting spot. It was so adorable that I had to take a picture. This iku is kind of the picture of a human back. The lines on the sides are the sides of the torso, and the line in the middle is the spine. It does the trick. Hoo, hoo! 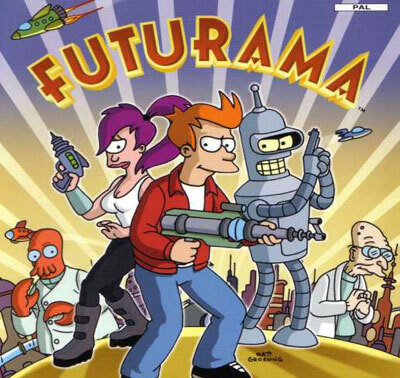 In 10 minutes, I’m going to watch the season premiere of Futurama! I can’t wait! A male hava ei iu heli. Notes: Today’s word is a standard ikunoala that has been adopted as a future tense marker over time, but I chose it for a particular reason. It’s been awhile, but one of the funniest shows ever to get prematurely canceled is back on Comedy Central. Check it out at 10 p.m. I suppose Rupert Murdoch expects us to thank him. Fat chance. See, Matt Groening got frustrated with Fox (as can be expected) several seasons in to Futurama‘s first run. Fox did as it’s done with other hit shows it didn’t want to market anymore: Moved its slot around, stopped advertising it, etc. Matt wanted to take the show elsewhere. Fox, however, had a contract, and Rupert Murdoch himself vowed that Futurama wouldn’t be on Fox ever again—or anywhere else. Due to the success of the DVDs and reruns on [adult swim], dollar signs changed his tune. So Fox has allowed Futurama to broadcast new episodes on Comedy Central—at least 26 (maybe). We’ll see how this goes. In the meantime, though, it’s a happy day! Today’s iku looks an awful like the American flag, I’ll admit. That was totally unintentional. What you have is three lines for the ground, and a hole dug into it, and then below that, the ground determinative. Admittedly, it is kind of ugly, but sometimes you need ugly glyphs. They kind of round out the system; give it balance. You are currently browsing the Kamakawi Word of the Day blog archives for June, 2010.